Wow, this summer is flying by. Unreal. As much as I’ve think about updating everyone on the bees, we’ve just been so stinking busy this summer. We’ve had several more swarms since early summer, but other than that, the girls have been working hard gathering nectar and food and making honey. There’s hasn’t been much more to tell until now. So here’s a few bits to catch you up. I can’t say I’ve experienced ant problems. We add a base to the bottom of each hive with PVC cups that I keep filled with water. They really help keep the ants and crawly critters out of the hives. But the other day I saw a TON of ants collecting at the base of one hive. Base frame with ant-deterring PVC cups that we keep filled with water. I thought of several options for removing them, but most are not good for the bees. What I came up with was cinnamon. I added several tablespoons of cinnamon to an old spice bottle and shook the cinnamon over the ants and around the base of the hive on the ground and on the cinder blocks. Worked like a charm. They picked up and moved someplace else that’s not around my hives. 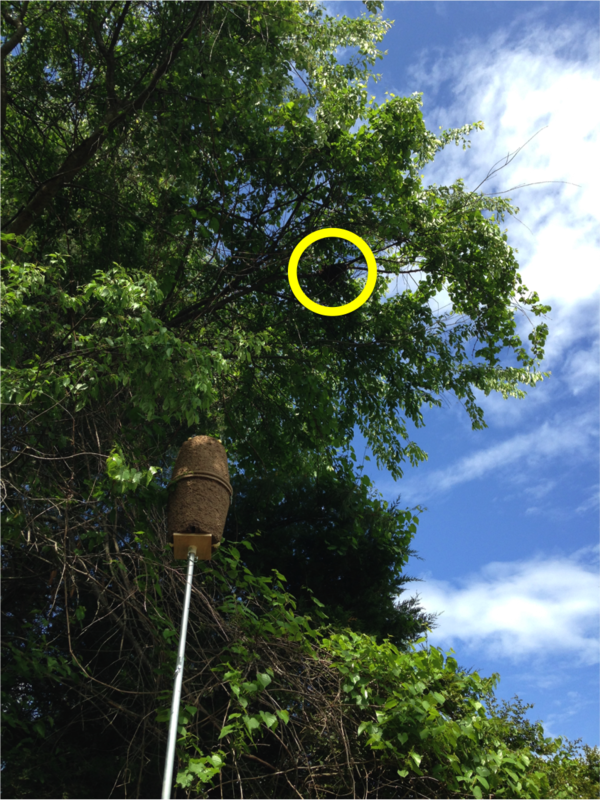 I received a frantic call from my neighbor this morning…one of those “your bees are swarming!” calls. Ugh. 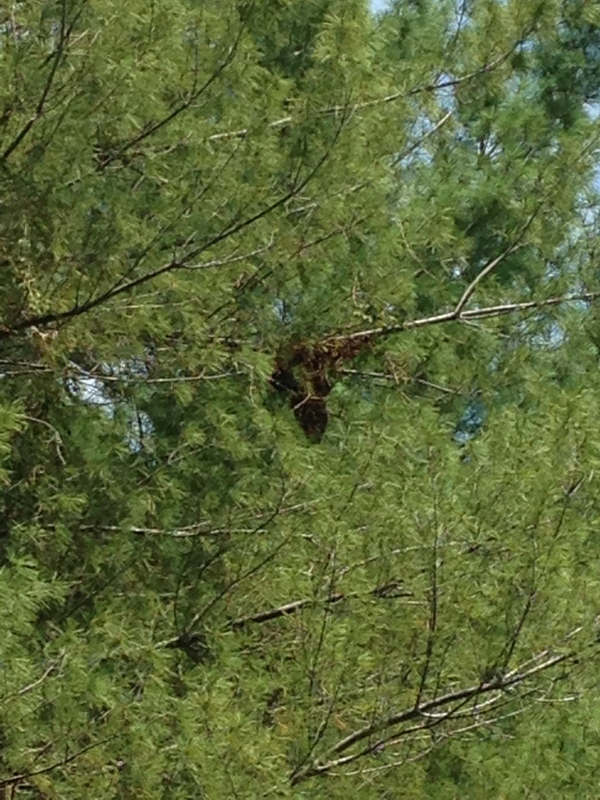 I ran out and watched a large swarm of bees buzzing their usual 30+ feet up into a pine trees. I ran to my hives to see if I could tell which hive was the culprit. No signs whatsoever, just business as usual. Usually they all go nuts when one of the hives swarms. But they were quietly going about their business. So I have to wonder if it came from one of my hives, or maybe it was one of my swarms still looking for a place to live. To bee honest, I’m not sure how long swarms hang around before they find refuge or meet their demise. I grabbed a copier box and cut a small hole in the bottom for an entrance. Added one frame of old comb and one frame of fresh foundation. Lined the inside with lemongrass essential oil. Added the lid and lined the outside of the entrance with lemongrass oil. Taped every possible opening to make it secure and ensure the entrance was the only place where they could come and go. Then found the hubster’s old ladder, climbed the tree and placed it between some strong branches and secured with cable ties. Not too bad, really. Do I think it will work. Heck no, but I have a better chance than not doing anything at all. So we shall see. On the honey front, I’ve collected about 5 or 6 frames and plan to collect more this weekend. They’ve produced lots of honey, but still a lot of capping to do. Unlike past years, I’m collecting as I go then will extract around Labor Day weekend. One last thing, I have to introduce Pink Hive, our newest addition to the apiary. Pink Hive is a split from Purple Hive, and next week I’ll be checking to make sure we have a good laying queen. Purple Hive is my strongest hive, the one with the Pennsylvania queen. Purple Hive is one that swarmed recently. They are mite-resistant bees, they populate like crazy, make lots of honey, overwintered like a charm, and until now, haven’t swarmed. Plus, they’re gentle to work with. Polar opposite of my Texas queens. I bought my queen from Log Cabin Bee Farm. The mated queens aren’t cheap, but they are top quality and worth every penny. You only need one good hive to get more hives going. My goal is to get all of my hives transitioned to this amazing PA stock. So there you go, the latest and greatest. The girls are doing great. At least they’re getting their swarming out of the way before it’s too late in the season. They still have time to build back up for winter. Fingers crossed for a good honey harvest! Happy summer everyone! It may bee the first, but it certainly won’t bee the last swarm of the season. The funny part is that I never saw it happen. I knew it was inevitable (tis the season), so I’d been itching to get the our swarm lure up. We found a super tall telescoping pole on clearance, perfect for raising and lowering a swarm lure. 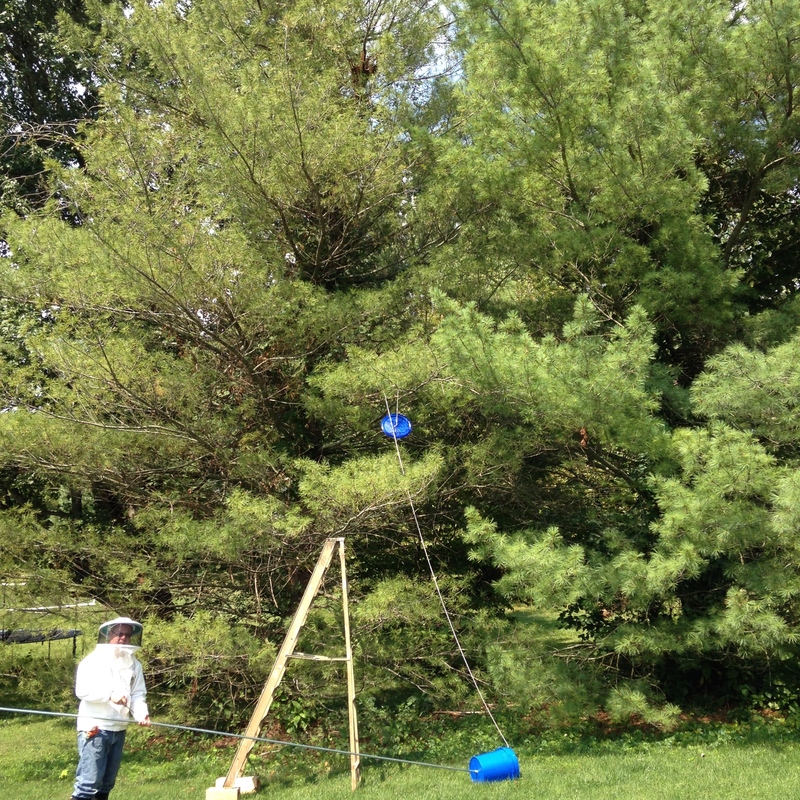 We took it out back, placed the lure on the pole and began to raise it high into the trees. I looked up, and I’ll bee darned if there wasn’t a healthy cluster of bees hanging stealth-like in the very top branches. About 15 feet above the swarm lure. Buggers! They always go too high, so once again, I couldn’t retrieve them. The other bees were flying around in wild frenzy in front of their hives – their typical response when a swarm occurs. I should’ve known something was up. Theoretically, scout bees seek out a new residence weeks before they swarm, so I had little hope that they’d sniff the lemongrass oil and make a b-line for the lure. But it didn’t keep me from hoping. We kept watch through the evening. They were in the same spot the next morning, but gone by the time we returned home from work. Another one lost…probably in someone else’s hive by now. I’ll admit that my response this year is much more calm and accepting than last year. I still don’t know which hive it came from. They all look just as busy and well populated as they did before. Beekeepers have lots of “rules of thumb” to keep us at least one step ahead of the little buggers. The bees, however, don’t know or care about our rules. The bees have their own rule. They do what they want to do, when they want to do it. That’s their rule. The past month has been uneventful at BooBee Apiary. It’s been nice. Everyone minding their own beeswax, collecting nectar and pollen and working hard to make us honey while we gather and enjoy garden veggies and plan out our pending honey harvest. I’ve been adding new boxes, ensuring they have space, and I’ve added vented spacers to help air circulation and provide more entrances. We’re now in August – the bees should bee switching their focus from reproduction to gathering stores for winter. The girls kick the male bees (drones) out of the hives, the workers start packing comb with honey, and the rapid growth subsides. So swarming this late in the year is not so common. What’s more, swarming of a first year hive is an even more rare occasion. It’s those over-wintered, well-seasoned hives you have to worry about. I don’t do many full inspections unless outside activity indicates a problem. Pink Hive was crowded, and I’d just given them a fresh box with new foundation, just above the brood and below the stores. I closed them up and we went camping for four days. Sunday we returned, tired and smelling of campfire. I had just finished my shower when the hubster came up and said my bees had swarmed. “Say what???”. It was Pink Hive – a June split from Blue Hive. The queen originated from a large swarm cell I had placed in with the split. I came outside just in time to see the flurry of activity that remained in front of the hive. I thought at first that the hubster was mistaking orientation flights for a swarm, until he pointed 30 feet up into the neighbor’s pine tree. There hung a massive cluster of bees, every bit as large as our first swarm back in June. Ugh. The hubster grabbed the step ladder and a bucket conduit contraption. He suited up and climbed the ladder. First time, the bees were too high and he couldn’t reach them. We added another piece of conduit and extended up just beneath them. He could barely reach, but still, he positioned the bucket as best he could beneath the cluster and gave the bucket an upward shove. Half the bees fell into the bucket, I pulled the lid on with the rope, and the hubster came flying down off the ladder yelling “GO, GO!!!”. The bucket remained in the tree, and the girls were not happy! I thought the lid only partially covered the bucket opening. We couldn’t see because the bucket was 30 feet up, but we thought the bees could easily fly out and back to their cluster. 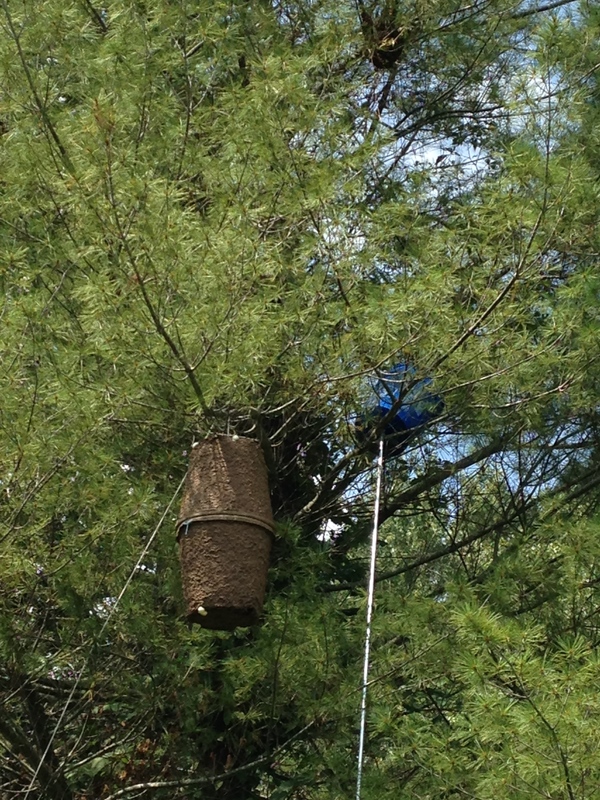 In the meantime, we hung a swarm trap, scented with lemongrass oil, then we headed out for Sunday errands. Several hours later, the half cluster hung in the same location. The hubster pulled down the conduit, and before it even reached the ground, I could see a large mass of bees were still in the bucket. I yelled and we prepared to run, but nothing happened when it hit the ground. A mass of bees spilled out, limp on the ground with a few live bees still fluttering through the remains. 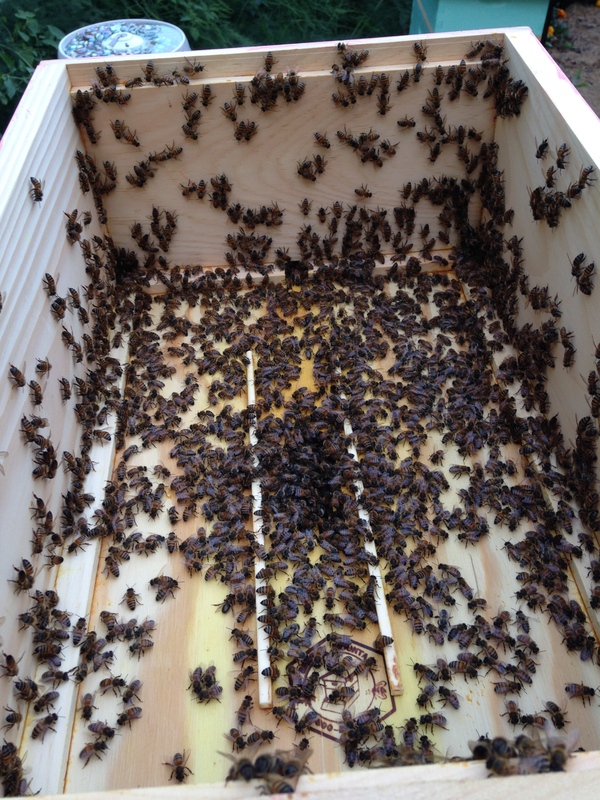 The lid had closed tighter than we thought and the bees had asphyxiated and were wet with condensation. I felt sick. I didn’t look for a queen. Swarms can have multiple queens, and I assumed the large cluster above still had at a queen to cling to. The cluster remained through the next morning and were gone when we returned from work that day. Another irretrievable swarm. 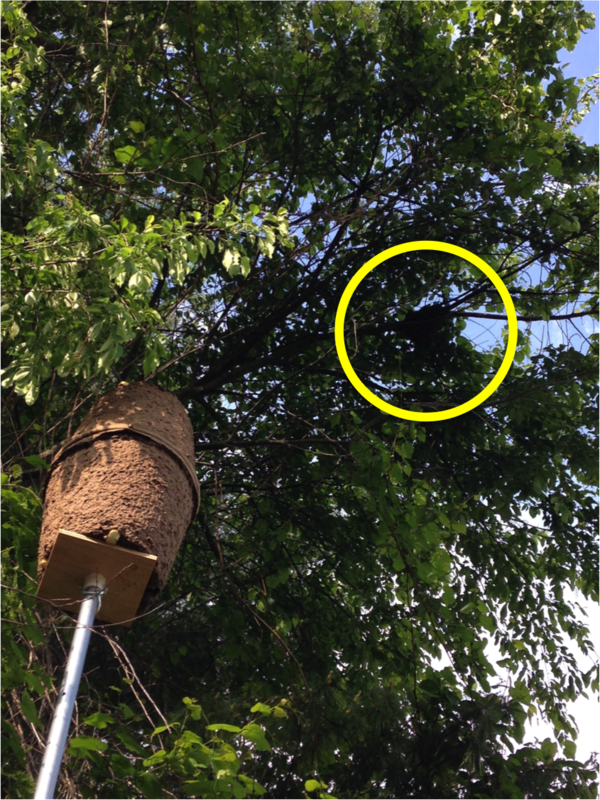 I had made some homemade swarm traps, so as a last stitch effort, I applied some lemongrass oil, inserted a frame of fresh foundation, and we lured it up into the tree, just a few feet beneath the swarm. No luck, but worth the try. What can I say…another lesson of what not to do. I am convinced that a beekeeper’s best advantage is experience. Hands down, good beekeeping comes with experience. Our experience now includes 2 unsuccessful swarm retrievals, and more fatalities than I care to think about. Now we stand back and rethink our strategies, like keeping the swarm traps in place; fashioning a more sturdy conduit contraption; inspecting more often. Though our best lesson is this: if a swarm is unreachable, if they can’t be retrieved safely and assuredly, let them go. Better to do it right than muck it up.